The 2017 BC election took place during the heights of a housing and homelessness crisis, yet none of the Parties centered their campaigns on an adequate response to these crises. No one said: if elected, we promise to end homelessness. Now politicians are trying to bury the issue, making it a normal and accepted part of life in BC. The election exposed the inability and unwillingness of the electoral parties to really grapple with the housing crisis. Our communities cannot afford to wait for them to change, and on the ground in our communities, we have never stopped fighting for housing justice and tenant security. We have never accepted a world with homelessness. On May 17th, a group of residents from the Ten Year Tent City trekked to the Supreme Court to defend their charter rights against the City’s pending emergency injunction. At the trial, the City argued that the tent city at 950 Main Street stalled the development of social housing on the city-owned lot, which has been vacant and owned by the City since 1998. Without legal counsel tent City residents challenged the City’s sudden urgency to develop the site, spoke to the benefits and importance of maintaining the tent city and how displacing the tent city without providing residents with alternatives would significantly compromise the health, well-being, and safety of tent city residents by pushing them back into the streets, back alleys, and parks where they are less safe and more vulnerable to violence, theft, and fatal overdoses. Judge Neena Sharma sided with the homeless campers, agreed that injunction jeopardized homeless people’s charter right to life, liberty, and security, and said the City of Vancouver had failed to prove how the tent city would cause irreparable harm to the public good. The supreme court decision affirms the lives and struggles of homeless people and is a historic victory for the tent city struggle. 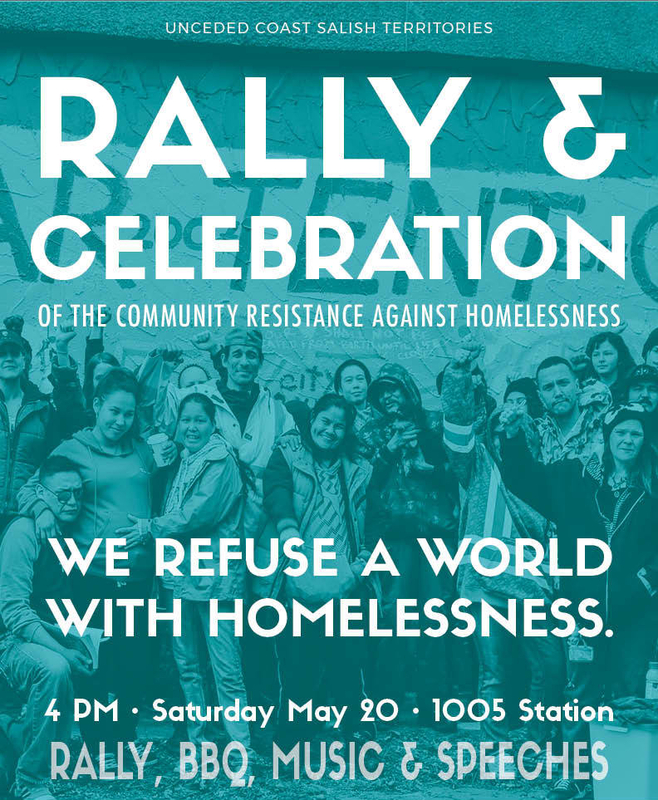 Come out on Saturday and celebrate the Ten Year Tent City victory and the community resistance against homelessness! We acknowledge that this event is being organized on the occupied, unceded traditional territory of the Coast Salish peoples, including the territories of the xʷməθkʷəy̓əm (Musqueam), səl̓ilwətaʔɬ (Tsleil-Waututh), Sḵwx̱wú7mesh (Squamish), and Stó:lō Nations. It is a potluck BBQ and feast, so please bring along some food or drinks if you are able to. We need a BBQ for the event so if you have a big BBQ and you are able to bring it, please contact organize@stopdisplacement.ca and let us know.